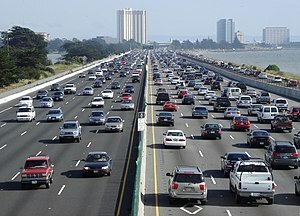 Interstate 80 is a major urban freeway in the Bay Area (seen here in Berkeley, California as the Eastshore Freeway). Transportation in the San Francisco Bay Area is reliant on a complex multimodal infrastructure consisting of roads, bridges, highways, rail, tunnels, airports, and bike and pedestrian paths. The development, maintenance, and operation of these different modes of transportation are overseen by various agencies, including the California Department of Transportation (Caltrans), the Association of Bay Area Governments, San Francisco Municipal Transportation Agency, and the Metropolitan Transportation Commission. These and other organizations collectively manage several interstate highways and state routes, two subway networks, two commuter rail agencies, eight trans-bay bridges, transbay ferry service, local bus service, three international airports, and an extensive network of roads, tunnels, and bike paths. A 2011 Brookings Institution study ranked the San Francisco MSA and the San Jose MSA sixteenth and second, respectively, on transit coverage to job access. Another nationwide study, conducted by the University of Minnesota in 2014, ranked the San Francisco MSA second and San Jose MSA tenth. Despite this, the San Francisco Bay Area remains the second most traffic-congested region in the country with a declining per capita use of public transit. In 2013, the San Francisco-Oakland-Hayward metropolitan statistical area (San Francisco MSA) had the second lowest percentage of workers who commuted by private automobile (69.8 percent), with 7.6 percent of area workers traveling via bus. During the period starting in 2006 and ending in 2013, the San Francisco MSA had the greatest percentage decline of workers commuting by automobile (3.8 percent) among MSAs with more than a half million residents. 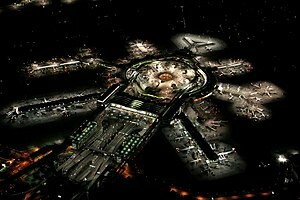 An aerial view of San Francisco International Airport at night. The following airports are served by commercial airlines. In addition there are many general aviation airports in the region. The busiest in the region, and a major international hub airport in California second only to LAX (Los Angeles). Hub to United Airlines and Virgin America. The second-busiest airport in the region and a major base airport for Southwest Airlines. Oakland International Airport is the oldest of the Bay Area's civilian airports still in use. The site was chosen due to its superior weather conditions for aircraft operations. The third-busiest and fastest-growing airport in the Bay Area. Another minor airport is Charles M. Schulz - Sonoma County Airport (STS) in Santa Rosa. It is served by Alaska Airlines, American Airlines, United Airlines, and Sun Country Airlines. Airport shuttle buses and vans provide services from the three major San Francisco Bay Area airports, namely San Francisco International Airport (SFO), Oakland International Airport (OAK), and San Jose International Airport (SJC) — Flat Rate Airport Taxi Cab and Car Service; BayPorter Express Airport Shuttle; Marin Airporter; Marin County Airport Shuttle; Monterey Airport Shuttle; Non Stop Airport Shuttle; Sonoma County Airport Express; SuperShuttle; and Cook Limousine Services. Map of Bay Area Regional Rail Services. Public transportation in the San Francisco Bay Area is quite extensive, including one heavy rail/commuter rail system, one commuter rail line, two light rail systems, Amtrak inter-city rail service, and four major overlapping bus agencies, in addition to dozens of smaller ones. In addition to rail and bus systems, there are multiple public and private ferry services, such as Golden Gate Ferry, which are being expanded by the San Francisco Bay Water Transit Authority. Most of the larger agencies accept the Clipper Card, a reloadable contactless smart card, as a universal electronic payment system. An extensive rail infrastructure that provides a mix of services exists within the nine Bay Area counties. Bay Area Rapid Transit, commonly known as BART, provides subway service in San Francisco and parts of Oakland and Berkeley, and commuter rail service to Contra Costa County, Alameda County, and San Mateo County. An expansion that is currently under construction will build an additional station in Alameda County and bring BART south into Santa Clara County by 2019. Caltrain, which runs on the right-of-way of the historic Southern Pacific Railroad, provides commuter rail service on the San Francisco Peninsula, linking the cities of San Francisco, San Jose, Gilroy, and numerous peninsula cities in between. The Millbrae Intermodal Terminal provides transfers between Caltrain and BART. The Altamont Corridor Express, commonly known as ACE, also provides commuter rail service, but from the Central Valley into Silicon Valley, terminating in the San Jose Diridon Station. In addition, Amtrak has a presence throughout the Bay Area. Stations in Martinez and Emeryville feature Coast Starlight and California Zephyr service. The Capitol Corridor connects Bay Area cities to Sacramento, and features BART transfer stations at Richmond and the Oakland Coliseum. The Bay Area also has two light rail systems: one run by San Francisco Municipal Railway called Muni Metro, which operates within the city of San Francisco, and the other run by the Santa Clara Valley Transportation Authority, which operates within Santa Clara County. A series of overlapping bus agencies provide additional public transit coverage to Bay Area regions both served and not served by rail transit. The four largest agencies, Muni, AC Transit, SamTrans, and VTA operate within the City of San Francisco, East Bay, the Peninsula, and South Bay respectively, although their service areas generally overlap with neighboring agencies and numerous smaller agencies. All of these agencies also provide limited night bus service, which are intended to "shadow" the rail routes that are closed during the nighttime hours for maintenance. In addition, the four bus agencies are each independently pursuing constructing bus rapid transit systems by developing separated right-of-ways and traffic signaling on busy corridors, including on Geary and Van Ness for Muni, El Camino Real for SamTrans and VTA, and International Boulevard for AC Transit. Although BART and certain bus agencies provide travel over (or under) the San Francisco bay, Golden Gate Transit also runs the Golden Gate Ferry, which along with private operators Blue & Gold Fleet and Red & White Fleet provide ferry service across the bay. The ferry, along with all the major train and bus operators, allow bicycles onto their systems with no additional charge. In addition, Bay Area residents may rent bicycles from the Bay Area Bike Share in certain parts of San Francisco, San Mateo, and Santa Clara counties. Megabus recently[when?] relaunched intercity bus service in California and Nevada. San Francisco riders can choose from three routes (SF-San Jose-LA, SF-Oakland-LA, & SF-Sacramento-Reno). The San Francisco stop is located in front of the Caltrain Station. Other intercity bus services include California Shuttle Bus, Hoang Transportation, and USAsia. There are several bus stations in the San Francisco Bay Area including Fairfield Transportation Center, Richmond Parkway Transit Center, Naglee Park and Ride, Hercules Transit Center, Curtola Park & Ride, Eastmont Transit Center, San Rafael Transit Center and many bus bays at BART stations. Note that some of the bus agencies listed above may have primary operating zones outside of the Bay Area, but serve at least portions of Bay Area regions. There are also private ferries from Emeryville, Berkeley, and Richmond. A bike share station in San Jose, California. Ford GoBike (launched as Bay Area Bike Share) is a regional public bicycle sharing system that serves the cities of San Francisco, Oakland, Berkeley, Emeryville, and San Jose. The bicycles are available 24 hours a day, seven days a week to anyone who purchases a membership, with three options, annual fee of US$149, US$20 for three days or US$10 for 24 hours. Any rider may take unlimited trips of up to 30 minutes, as measured from the time the bike is withdrawn from a dock to the time it is returned. Bikes can be picked up at any of the stations using a key fob or electronic code, and dropping them off at any station. Longer trips incur additional fees starting at US$4 for the first additional half-hour, since the idea of bike sharing is to make bicycles available for short trips. A replacement fee of $1,200 is charged if a rented bike is lost. Several companies also operate dockless bicycle sharing systems in the Bay Area such as Jump Bikes, Lime, and Spin. These dockless systems differ from the Ford GoBike system in that bicycles can be parked freely on the street (or at a bicycle rack in the case of Jump) and do not need to be docked at a designation station. Currently, Jump is the only dockless bicycle sharing company that operates in San Francisco while other competing companies operate dockless systems in other Bay Area cities such as South San Francisco, Oakland, and San Jose. In 2018, several companies started offering dockless scooter-sharing systems in Bay Area cities such as San Francisco and Oakland. These systems offer electric kick scooters for rent, similar to dockless bicycle sharing systems. Some operators, such as Lime, operate both scooter and bicycle sharing systems. These shared scooters were temporarily banned in San Francisco during summer 2018, but as of October 15, 2018[update] are available under two operators: Skip and Scoot Networks. The Bay Area possesses an extensive freeway and highway system (although it is not as extensive as Southern California). San Francisco - Oakland Bay Bridge The western terminus of I-80 is located in San Francisco as James Lick Skyway (Bayshore Freeway), just west of the San Francisco–Oakland Bay Bridge. The interstate continues to the east over the bridge, connecting to Oakland and the north coast of the East Bay as the Eastshore Freeway, and then on to Sacramento, Reno, and New Jersey. Richmond - San Rafael Bridge This spur route's western terminus is in Marin County. The Interstate crosses the San Pablo Bay over the Richmond-San Rafael Bridge, goes through Richmond as the John T. Knox Freeway, passes through Oakland as the MacArthur Freeway, then continues to Livermore, through the Altamont Pass to Tracy, where it intersects with Interstate 5, thus providing a link with Southern California. San Mateo - Hayward Bridge SR 92's western terminus is in Half Moon Bay. The two-lane highway crosses the Santa Cruz Mountains, connecting to Interstate 280 and U.S. Route 101 as the J. Arthur Younger Freeway, becoming a freeway as it passes through San Mateo before crossing the San Mateo-Hayward Bridge to Hayward as Jackson Street. Dumbarton Bridge SR 84 begins at Route 1 (at the Pacific Coast) near San Gregorio State Beach, and crosses the Santa Cruz Mountains on a scenic route between La Honda and Woodside as Woodside Road. It then crosses the Bay over the Dumbarton Bridge from Redwood City to Newark. The route then passes through Fremont as Thornton Avenue and Peralta Boulevard, continuing as Niles Canyon Road to Sunol and Livermore as Vallecitos Road and Isabel Avenue, terminating at Interstate 580 as Airway Boulevard. Bayshore & South Valley Freeways Eight-lane and, in some parts, 10-lane freeways connecting San Francisco to San Jose through the Peninsula. Highway 101 continues south to Gilroy and Salinas, California, before continuing to Los Angeles. For most of its route I-280 runs along the foothills of the Santa Cruz Mountains, and is very scenic, while 101 is highly urban. Skyline Boulevard Two-lane highways also traveling down the Peninsula, SR 1 along the Pacific coast, and SR 35 near the ridge of the Santa Cruz Mountains. SR 1 as Cabrillo Highway connects to Half Moon Bay, Santa Cruz, and Monterey, before continuing to Los Angeles. Route 17 Highways through the Santa Cruz Mountains, connecting the South Bay to Santa Cruz. Part of SR 17 in San Jose is an 8 lane freeway. Southbay Freeway Six-lane and, in some parts, seven to eight-lane freeways connecting the west Santa Clara Valley to the east Santa Clara Valley, bypassing Downtown San Jose. Route 152 Two-lane highway from Watsonville, crosses the Santa Cruz Mountains to Gilroy, then crosses the Diablo Range through Pacheco Pass to I-5 near Los Banos. Route 156 Two-lane highway connecting the Monterey Peninsula from Castroville to northern San Benito County and Route 152. El Camino Real Highway running from San Jose to Interstate 280 in San Francisco. It is designated a State Route, although it is more similar to an inner-city boulevard, and contains either 2, 4, or 6 lanes. It runs from Daly City in the north through the Peninsula and beyond. The freeway system in Santa Clara county is augmented by the Santa Clara County expressway system. Interstate 505 This interstate highway provides a direct link from Interstate 80 in Vacaville in Solano County to I-5, bypassing Sacramento. Route 29 Four-lane expressway connecting Interstate 80 in Vallejo in Solano County as Sonoma Boulevard to the towns of American Canyon and Napa. North of Napa, SR 29 is a two-lane rural highway through the towns of the Napa Valley, California's Wine Country, to Clear Lake. Route 37 Four- and two-lane expressway connecting US 101 in Novato with Interstate 80 in Vallejo, along the northern shore of San Pablo Bay. Sonoma Highway A highway connecting Santa Rosa with suburbs to the west and Interstate 80 through Sonoma and Napa to the east. Nimitz Freeway Two interstate highways that travel up the East Bay from San Jose, 880 close to the bay to Oakland and 680 inland from San Jose north through Fremont, Pleasanton and Concord; then crosses the Benicia-Martinez Bridge and ends at Interstate 80 in Fairfield. Grover Shafter Freeway A freeway entirely in Downtown Oakland and begins at Interstate 880 and travels north to become Route 24 at Interstate 580. The freeway continues north as SR 24, which is a state highway that begins at Interstate 580 in Oakland and travels east through the Caldecott Tunnel to Interstate 680 in Walnut Creek. Interstate 205 This interstate highway's western terminus is at Interstate 580 in Alameda County just west of the San Joaquin County line. I-205 heads east through Tracy to I-5, providing access from the Bay Area to Stockton and the northern San Joaquin Valley. Warren Freeway A highway entirely in the Oakland Hills and travels north from Interstate 580 to Route 24, where the freeway portion ends. Beyond SR 24, SR 13 is Berkeley's Ashby Avenue. Mission Boulevard An arterial from Fremont to Hayward, along the base of the hills, then becomes a freeway near Oakland. California Delta Highway Western terminus at Interstate 80 in Hercules, travels east through Martinez, Pittsburg, and Antioch, where the freeway portion ends. The highway continues to Brentwood and east to Stockton. The Alemany Maze is the interchange between the James Lick Freeway (U.S. Route 101) and Interstate 280. The MacArthur Maze is the interchange between the Eastshore Freeway, Nimitz Freeway, and MacArthur Freeway at the east end of the Bay Bridge. The Joe Colla Interchange is the interchange between US 101, I-280, and I-680. Both I-280 and I-680's southern termini is located as this interchange. The Bay Bridge offers the only direct automobile connection from San Francisco to the East Bay. The Golden Gate Bridge is the only road connection from San Francisco to the North Bay. State Route 1 also enters San Francisco from the north via the Golden Gate Bridge, but turns south away from the routing of U.S. 101, first onto Park Presidio Blvd through Golden Gate Park, and then bisecting the west side of the city as the 19th Avenue arterial thoroughfare, joining with Interstate 280 at the city's southern border. Interstate 280 continues south from San Francisco. Interstate 280 also turns to the east along the southern edge of the city, terminating just south of the Bay Bridge in the South of Market neighborhood. After the 1989 Loma Prieta earthquake, city leaders decided to demolish the Embarcadero Freeway, and a portion of the Central Freeway, converting them into street-level boulevards. State Route 35 enters the city from the south as Skyline Boulevard, following city streets until it terminates at its intersection with Highway 1. State Route 82 enters San Francisco from the south as Mission Street, following the path of the historic El Camino Real and terminating shortly thereafter at its junction with 280. Major east–west thoroughfares include Geary Boulevard, the Lincoln Way/Fell Street corridor, and Market Street/Portola Drive. The San Francisco Bay Trail alignment. The San Francisco Bay Trail is a bicycle and pedestrian trail that will eventually allow continuous travel around the shoreline of San Francisco Bay. As of 2016, 350 miles (560 km) of trail have been completed, while the full plan calls for a trail over 500 miles (805 km) long that link the shoreline of nine counties, passing through 47 cities and crossing seven toll bridges. Sections of the Bay Trail exist in all nine Bay Area counties. The longest continuous segments include 26 miles (41 km) primarily on gravel levees between East Palo Alto and San Jose in Santa Clara County; 25 miles (40 km) in San Mateo County between Millbrae and San Carlos; 17 miles (27 km) in central Alameda County from San Leandro to Hayward; and 15 miles (24 km) along the shoreline and on city streets through Richmond in Contra Costa County. The northernmost trail section passes through San Pablo Bay National Wildlife Refuge. 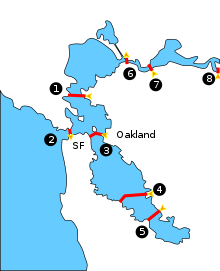 Due to the central location of the San Francisco Bay, eight toll bridges cross the Bay or Bay tributaries. Each of the bridges collect separate tolls, and all of them accept payment through FasTrak, an electronic toll collection system used in the state of California. Seven of these eight bridges are owned directly by the State of California, while the Golden Gate Bridge is owned and operated by the Golden Gate Bridge, Highway and Transportation District. The port currently uses Pier 35 to handle the 60–80 cruise ship calls and 200,000 passengers that come to San Francisco. Itineraries from San Francisco usually include round trip cruises to Alaska and Mexico. The James R. Herman Cruise Terminal Project at Pier 27 opened in 2014 as a replacement. The previous primary terminal at Pier 35 had neither the sufficient capacity to allow for the increasing length and passenger capacity of new cruise ships nor the amenities needed for an international cruise terminal. ^ "Missed Opportunity: Transit and Jobs in Metropolitan America (San Francisco)". Brookings Institution. Archived from the original on January 9, 2014. Retrieved January 8, 2014. ^ "Missed Opportunity: Transit and Jobs in Metropolitan America (San Jose)". Brookings Institution. Archived from the original on January 9, 2014. Retrieved January 8, 2014. ^ "Access Across America: Transit 2014". University of Minnesota. Archived from the original on October 16, 2014. Retrieved October 14, 2014. ^ McKenzie, Brian (August 2015). "Who Drives to Work? Commuting by Automobile in the United States: 2013" (PDF). American Survey Reports. Archived (PDF) from the original on December 21, 2017. Retrieved December 26, 2017. ^ "SJC Named Second Fastest Growing Medium Hub Airport in US for 2013". Archived from the original on 14 September 2014. Retrieved 14 September 2014. ^ "Airline Information". Charles M. Schulz Sonoma County Airport. Retrieved 2019-03-07. ^ a b c d e f g h i j k "APTA Transit Ridership Report - First Quarter 2016" (PDF). American Public Transportation Association (APTA). 19 May 2016. Archived (PDF) from the original on 8 October 2016. Retrieved 2016-10-25. ^ "Ridership Reports". Caltrain. Retrieved 17 October 2018. ^ "TEP Route Data & Proposed Changes". San Francisco Municipal Transportation Agency (SFMTA). 2013. Archived from the original on 2014-03-30. Retrieved 2014-04-08. ^ "BoltBus to launch Bay Area-Los Angeles service". Archived from the original on November 3, 2013. Retrieved November 6, 2013. ^ "Megabus.Com Expands Service To/From Los Angeles, San Francisco And Six Cities". Archived from the original on March 18, 2013. Retrieved March 26, 2013. ^ "AIBRA - Find a Station". Archived from the original on April 26, 2015. Retrieved May 2, 2015. ^ "Golden Gate Transit: Research Library". Archived from the original on 3 July 2014. Retrieved 14 September 2014. ^ "Report: Tech buses proliferating throughout Bay Area". eastbaytimes.com. 15 September 2016. Archived from the original on 25 January 2018. Retrieved 7 May 2018. ^ a b Nolte, Carl (December 28, 2016). "SF Bay ferries riding tidal wave of popularity". The San Francisco Chronicle. Archived from the original on December 30, 2016. Retrieved December 30, 2016. ^ "Membership and pass options". Ford GoBike. Retrieved 2018-06-18. ^ a b CBS San Francisco (2013-08-29). "Bike Share Program Launched In 5 Bay Area Cities". CBS 5 KPIX. Archived from the original on 2013-09-02. Retrieved 2013-09-14. ^ "Competing Bike Share Companies Launch Services In South San Francisco". CBS SF Bay Area. August 8, 2017. Retrieved September 12, 2018. ^ Baldassari, Erin (January 17, 2018). "JUMP Bikes to launch dockless, electric bikeshare in San Francisco". The Mercury News. Retrieved September 12, 2018. ^ Pender, Kathleen (March 29, 2018). "Scooters descend on San Francisco sidewalks". San Francisco Chronicle. Retrieved September 12, 2018. ^ Swan, Rachel (September 1, 2018). "As San Francisco banned scooter use, Oakland embraced the two-wheelers". San Francisco Chronicle. Retrieved September 12, 2018. ^ Chinn, Jerold (October 15, 2018). "Electric scooters power back onto San Francisco streets". SFBay. Retrieved October 15, 2018. ^ "San Francisco Public Transportation Statistics". Global Public Transit Index by Moovit. Archived from the original on August 24, 2017. Retrieved June 19, 2017. Material was copied from this source, which is available under a Creative Commons Attribution 4.0 International License Archived 2017-10-16 at the Wayback Machine. ^ Rodriguez, Joe (January 9, 2016). "San Jose's Infamous Monument to Nowhere Freeway Interchange Finally Named after Joe Colla". San Jose Mercury News. Archived from the original on April 22, 2016. Retrieved April 6, 2016. ^ a b Gordon, Rachel (September 8, 2005). "Boulevard of dreams, the premiere". San Francisco Chronicle. Hearst Communications. p. B-1. Archived from the original on September 30, 2008. Retrieved June 16, 2008. ^ "Bay Area FasTrak - Agencies and Partners". Bay Area Toll Authority. Archived from the original on 2016-09-19. ^ "SFPort – Cruises". Archived from the original on March 17, 2013. Retrieved March 16, 2013. ^ "SFPort – James R. Herman Cruise Terminal Project at Pier 27". Archived from the original on July 3, 2013. Retrieved March 16, 2013. ^ Engle, Jane (April 15, 2013). "LA Times – Cruises: The Grand Princess finds a home in San Francisco". Los Angeles Times. Archived from the original on April 22, 2013. Retrieved April 22, 2013. Wikivoyage has a travel guide for Bay Area public transit.